New York Rangers President and General Manager Glen Sather announced today that the club has bought out the contract of forward Chris Drury. In four seasons as a Ranger, Drury registered 62 goals and 89 assists for 151 points, along with 116 penalty minutes in 264 games. 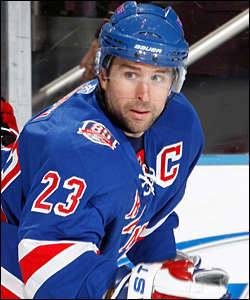 Chris Drury played 264 games of his 892 career NHL games to date wearing a Rangers uniform and was named the team's 25th captain on Oct. 3, 2008. He made his debut with the team on October 4, 2007, tallying the game-winning goal and adding two assists vs. Florida in the season opener. That season, he led the Blueshirts in power play goals (12) and game-winning goals (seven), tied for the team lead in goals (25), and ranked third in assists (33) and points (58). Drury led the team in power play goals (10) for a second consecutive season in 2008-09, en route to capturing his first of two Players’ Player Awards (2008-09, 2009-10). Drury, 34, is a Stanley Cup Champion and the only player in hockey history to win both the Hobey Baker Memorial Award as the top collegiate hockey player and the Calder Memorial Trophy as the NHL’s rookie of the year. The three-time Olympian, and two-time Olympic silver medalist with Team USA, was the winning pitcher for Trumbull, Connecticut in the 1989 Little League World Series vs. Taiwan. He has served as Rangers’ captain for the last three seasons, having been named the 25th captain in franchise history on October 3, 2008. In 2009-10, Drury led all NHL forwards in blocked shots (97) and was nominated for the Bill Masterton Memorial Trophy by the NY chapter of the Professional Hockey Writers’ Association (PHWA), awarded annually to “the NHL player who best exemplifies the qualities of perseverance, sportsmanship and dedication to hockey.” That season, he recorded his 250th career NHL goal and 600th career NHL point with an empty net goal on February 14 vs. Tampa Bay, and skated in his 800th career NHL game on October 19 vs. San Jose. Last season, Drury missed a total of 57 games due to injury. Prior to joining the Rangers, Drury skated for three seasons with the Buffalo Sabres, serving as team co-captain from 2005-06 to 2006-07. He reached the 30-goal and 60-point plateaus twice as a Sabre, including a career-high, 37 goals and 69 points in 2006-07. He also led Buffalo and tied for fourth in the NHL with career-highs in power play goals (17) and game-winning goals (nine) that season. Drury reached the 30-goal mark for the first time in his career in 2005-06, leading the Sabres in goals (30) and power play goals (16), and finishing second on the team in points (67). In the 2006 playoffs, Drury established career-highs in playoff scoring with 18 points and five power play goals in 18 games. He tied for third in the NHL in goals (nine) and power play goals, and sixth in points while leading Buffalo to the Eastern Conference Finals. The 5-10, 191-pounder has skated in 892 career NHL games with the Rangers, Colorado Avalanche, Calgary Flames, and Buffalo Sabres, registering 255 goals and 360 assists for 615 points, along with 468 penalty minutes. He has reached the 20-goal mark in nine of 12 NHL seasons and surpassed the 50-point mark eight times in his career. Drury began his NHL career with Colorado in 1998-99, capturing the Calder Memorial Trophy as the league’s top rookie and being named to the NHL All-Rookie Team. He established a career-high and ranked second on the Avalanche with 47 assists in just his second season. 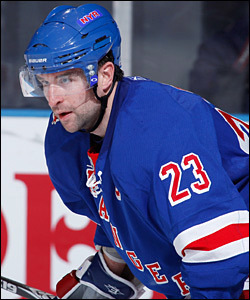 Chris Drury has represented Team USA at three Olympic Games, including the 2010 Vancouver Olympics when he was a member of the Rangers. In Stanley Cup Playoff action, Drury has appeared in 135 career contests with the Rangers, Avalanche and Sabres, registering 47 goals and 42 assists for 89 points, along with 46 penalty minutes. Drury is tied for fourth in the NHL all-time with four playoff overtime goals, and ranks sixth among active NHL players in playoff goals. He has participated in the playoffs nine times, having advanced to at least the Conference Finals in five of those nine seasons. Drury captured a Stanley Cup Championship with Colorado in 2000-01, establishing career-highs in postseason appearances (23) and goals (11). His 11 goals in the 2001 playoffs ranked second in the NHL. Prior to turning professional, Drury skated in 155 career games with Boston University of Hockey East (HE), recording 113 goals and 101 assists for 214 points. He won the Hobey Baker Award as college hockey’s top player in 1998, was runner-up for the Hobey Baker Award in 1997 and was a finalist for the award in 1996. Drury finished his college career first all-time in goals (113) and third in points (214) in Boston University history, and is the only Terrier with at least 100 goals and 100 assists. He captured the NCAA Men’s Ice Hockey National Championship as a Freshman in 1994-95. Internationally, Drury has represented the United States three times in the Winter Olympics (2002, 2006 and 2010), capturing the silver medal in 2002 in Salt Lake City, Utah, and in 2010 in Vancouver, Canada. He also participated in the 2004 World Cup of Hockey, the World Championships in 2004, 1998 and 1997, and the World Junior Championships in 1996. The Trumbull, Connecticut native signed with the Rangers as an unrestricted free agent on July 1, 2007. He was originally a third round choice of the Quebec Nordiques, 72nd overall, in the 1994 NHL Entry Draft.